German sponsorship research and consultancy firm, Sport+Markt, predicts that sports sponsorship spending by the top 20 automotive brands will top 800 million euros per year (or $1.17 Billion). 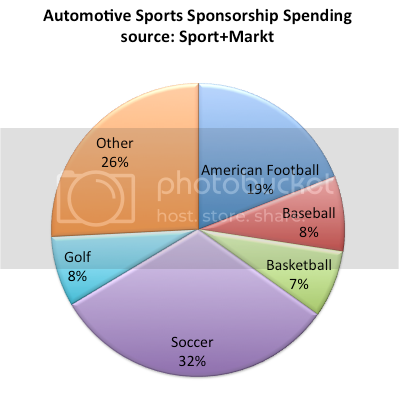 According to a recent study, automotive brands allocate the highest proportion of their sponsorship budgets to the sport of soccer (31.7%). American football (19.1%), baseball (8.2%) and golf (7.7%). In order to make an even comparison, the study did not take into account motorsports sponsorships, which can also include development contracts. The firm notes that GMC holds the top spot among biggest spending sponsors, followed by KIA, Toyota, Ford and BMW rounding out the top five.